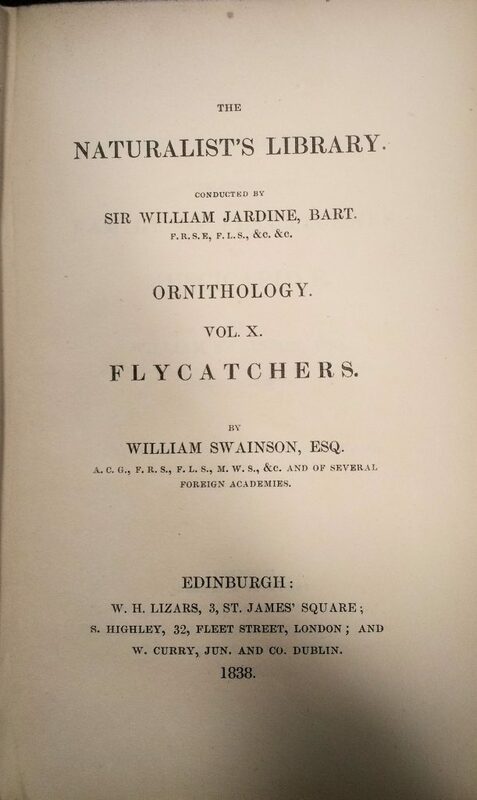 ‘Yellowbacks’ were an innovative and distinctive publishing format developed in the middle of the 19th century. These small format books were covered with glazed (usually yellow) paper covered boards, which was block printed with eye-catching imagery. 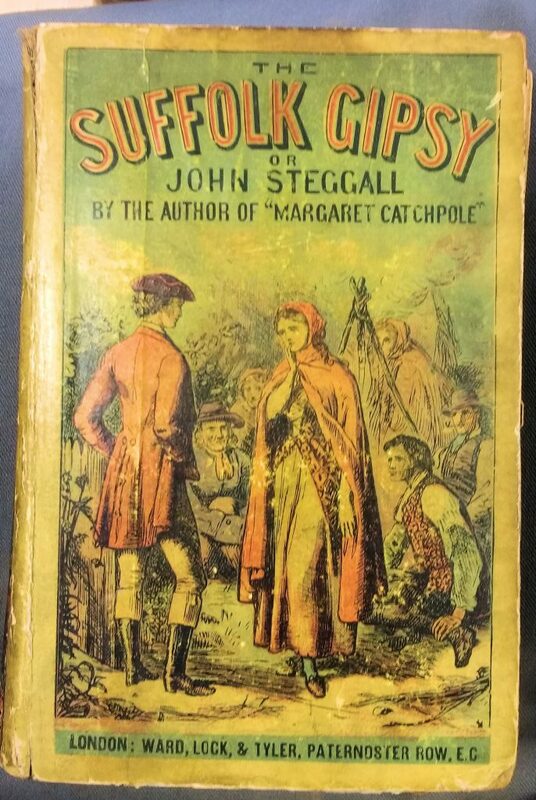 Designed to appeal to a growing market of readers, emerging in part as a result of the spread of education, the development of the ‘yellowback’ was also closely linked to the emergence of the first railway bookstalls. The format was designed to grab the attention of travellers in a hurry, and to capitalise on a spirit of adventure. 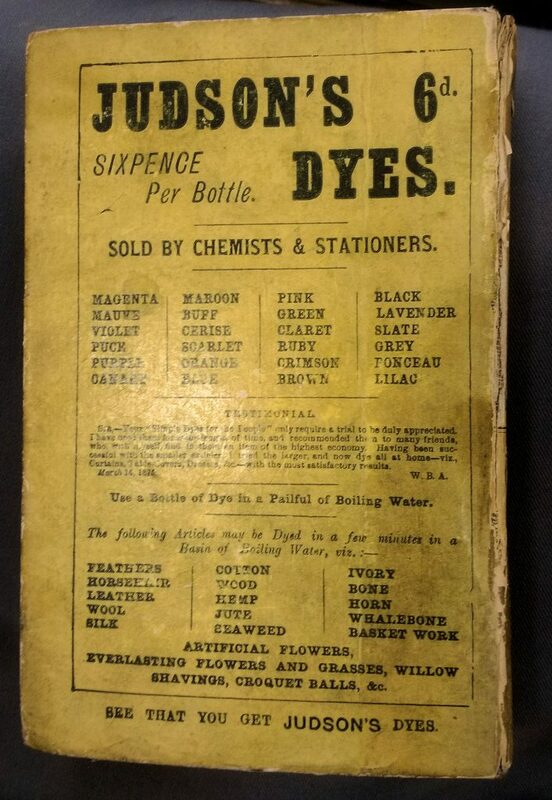 Yellowbacks were small, light, and cheap to buy – part subsidised by the use of advertisements. 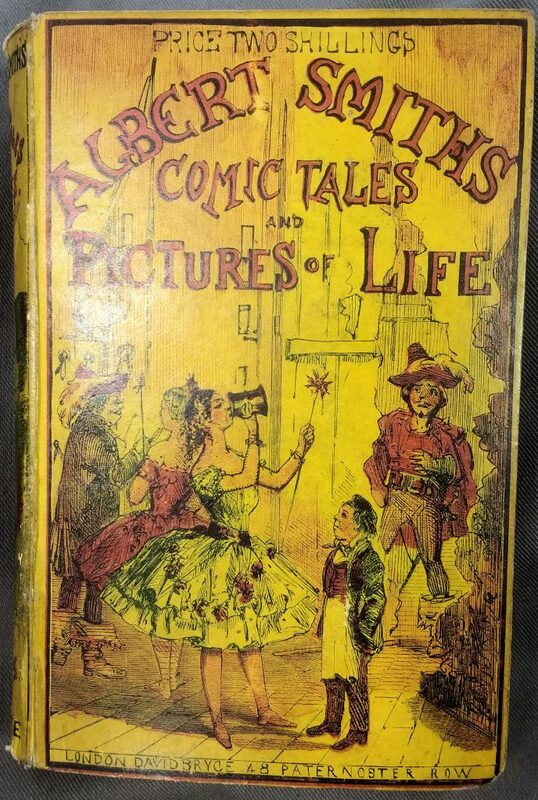 Inside these striking covers yellowbacks typically contained sensation novels, crime fiction and adventure stories – usually stereotyped reprints of earlier print editions of popular texts by well-known authors. James, Elizabeth. “Aspects of the Victorian Book: Yellowbacks”. The X-like letter in the title of this post is actually the lowercase form of the Greek letter ‘chi’ (the uppercase is X). 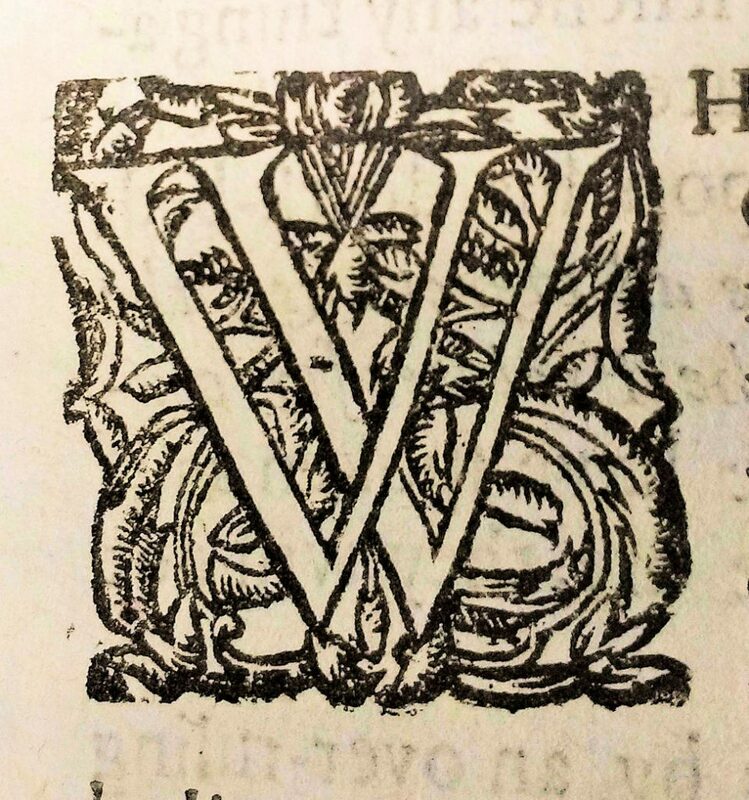 It earns a place in our A to Z of Books for its role in the collation of printed books: that is, recording all the leaves and gatherings (or quires) that make up the physical volume, as explained in our A is for Alphabet post. Signatures: *⁸ ²*² **⁸ A-I⁸ K¹² [chi]⁴ L-Ee⁸ ²A-B⁸. For many books, the letters of the printer’s alphabet (excluding J, U and W as being easily confused with I and V) are sufficient to describe the book in hand, but sometimes it is not so straightforward, which is where Greek letters come in. It is common to find these spelled out, as in the example above, instead of using Greek characters which may not be accessible across all devices. But what do they mean? It is common to find books in which not all the gatherings are signed (that is, marked with, for example, A, A2, A3… at the foot of the leaves in the folded sheet), but there isn’t an obvious gap for them in the alphabetic sequence. So, unsigned leaves at the start of the book, before gathering A, are indicated by the Greek letter π [pi] and unsigned leaves elsewhere are given the signature χ [chi]. And like all oddities in early printed books, looking at the physical volume may reveal what was actually going on as the book was printed and why these unsigned leaves are there. Karen Attar, “Collational formula” in Michael F. Suarez, S.J. and H.R. Woudhuysen eds., The Oxford Companion to the Book, 2010. Philip Gaskell, A New Introduction to Bibliography, 1995. Queen Elizabeth, Luncheon Menu 15 Feb 1958. 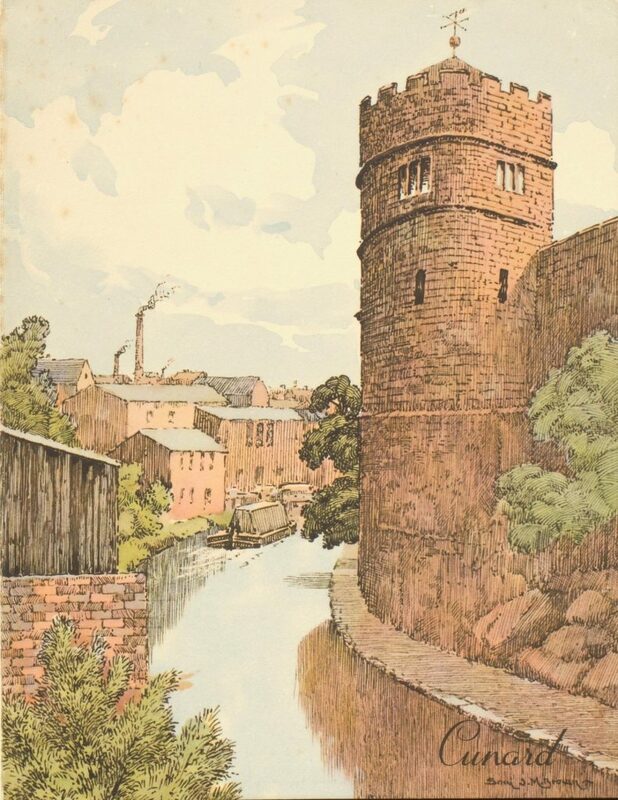 Image shows King Charles’s Tower, Chester. 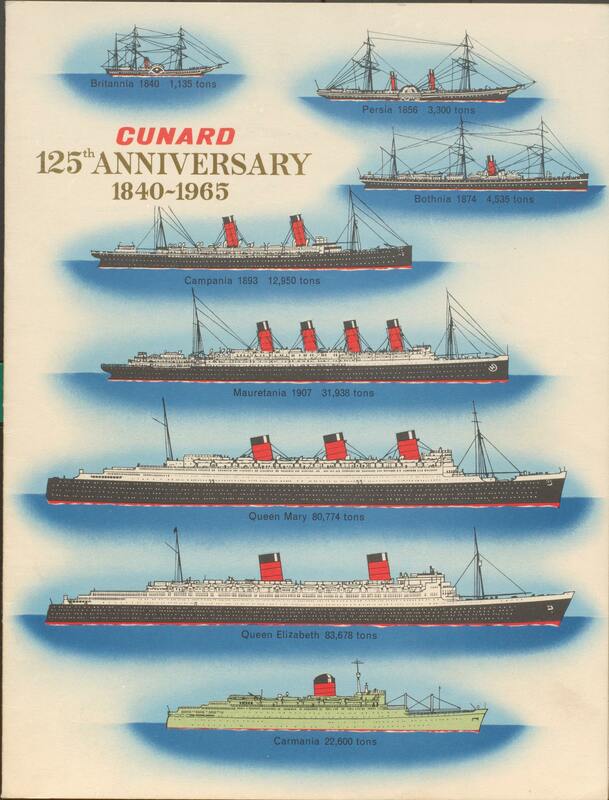 Menu cards within the Cunard Archive are enjoyed by archive users not only for the information within them, but also for their attractive cover designs. 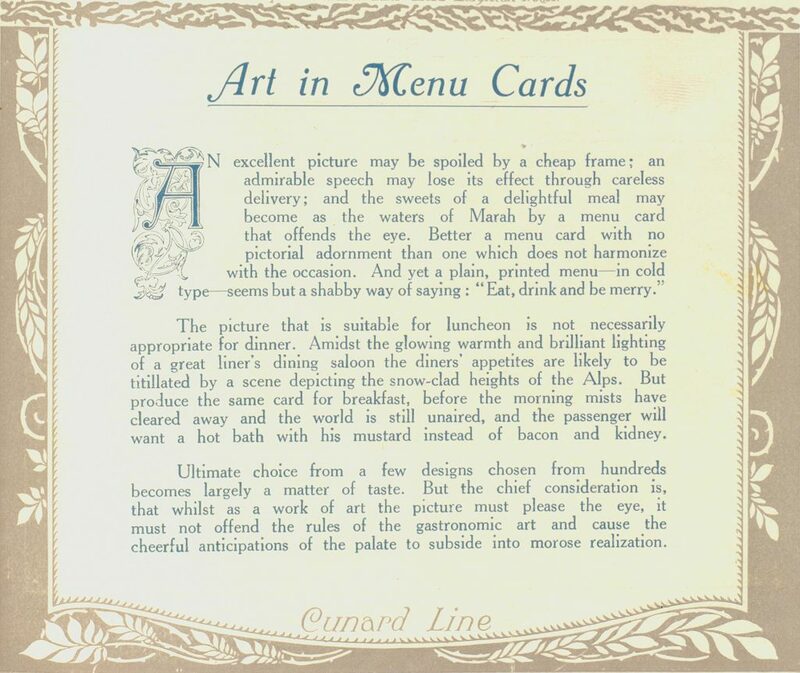 An article published in Cunard News in 1922 describes how art printed on a menu card is carefully chosen to enhance the dining experience of guests. 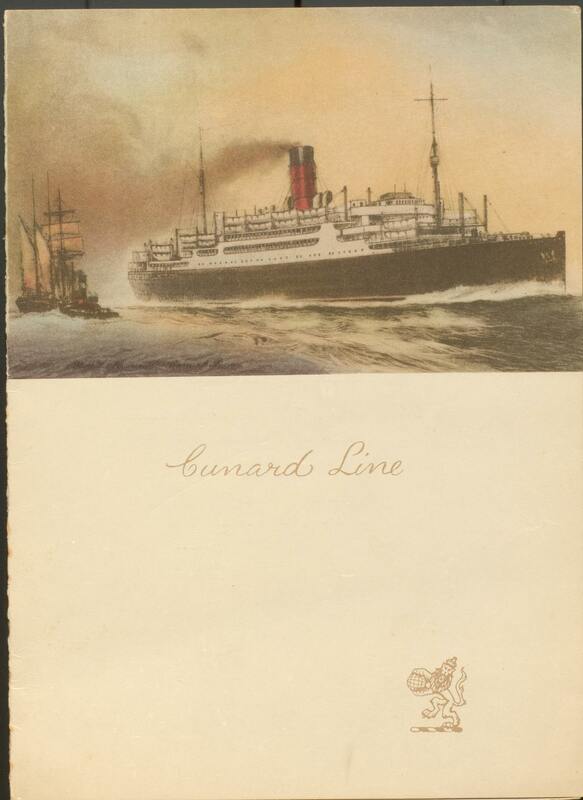 Menu cards were popular mementos, kept by passengers to remind them of their experience on board a Cunard ship. Queen Mary Luncheon Menu, 31 August 1967. 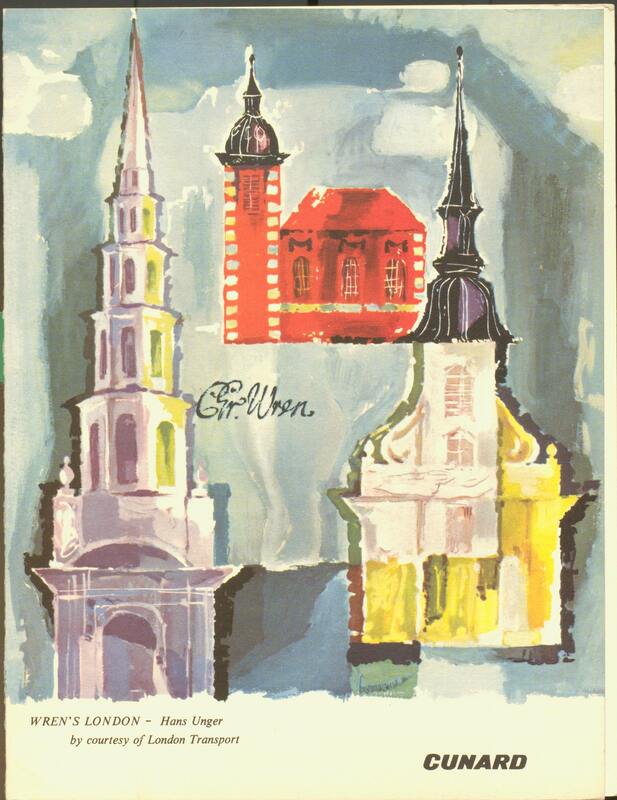 Illustration shows `Wren's London' by Hans Unger. 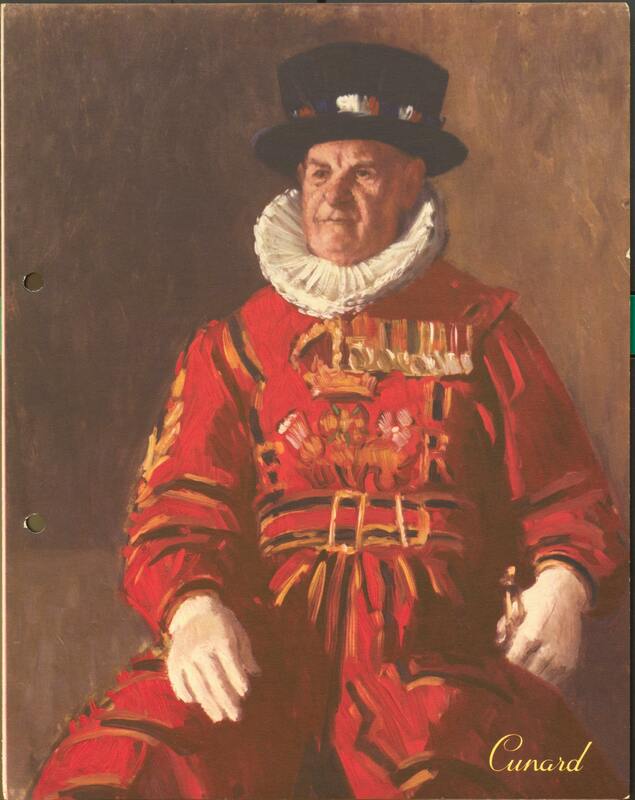 Queen Elizabeth Luncheon Menu, 20 October 1965 Illustration shows reproduction of painting by [Georges?] 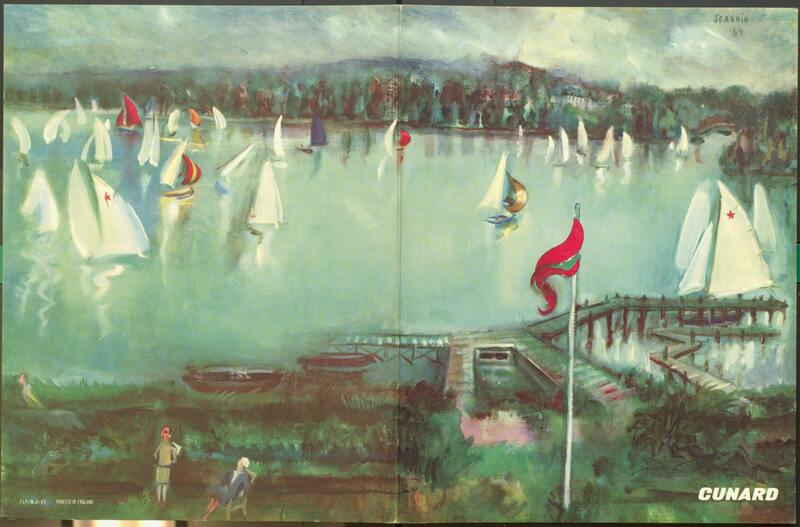 Jeannin of river and sailing boats. 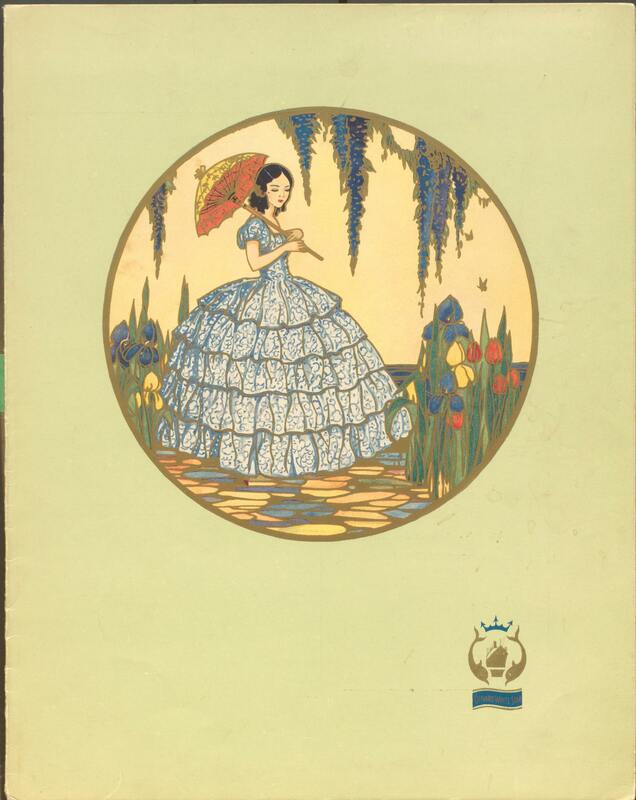 Britannic III Luncheon menu, 6 October 1949 Cover artwork shows a reproduction of `Merrie England', a painting by Philip Connard. The painting also hung in the restaurant of R.M.S. Queen Mary. 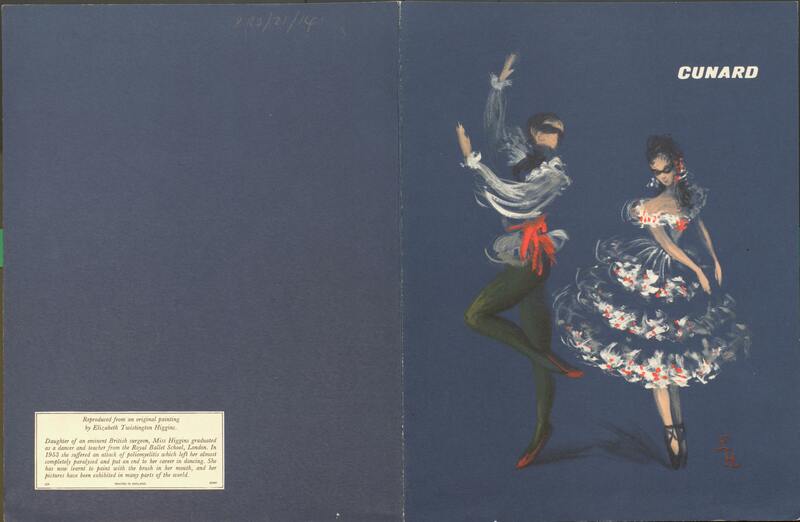 Queen Elizabeth Dinner Menu, 23 September 1965 Reproduction of painting of dancers by Elizabeth Twistington Higgins. 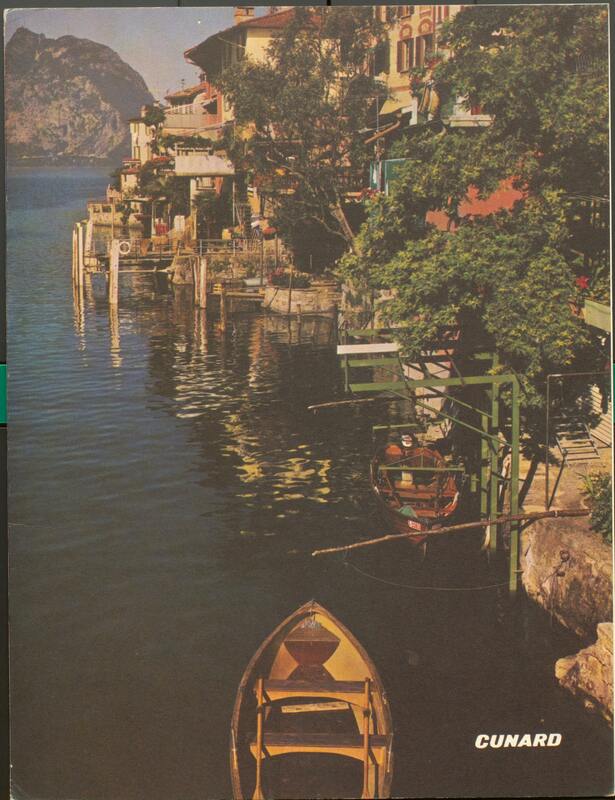 Queen Elizabeth Dinner Menu, 14 April 1966 Illustration shows Gandria, Lake Lugano, Switzerland. Queen Elizabeth, Cunard 125th Anniversary Gala Night Dinner Menu, 4 July 1965 Illustration shows various ships through Cunard history. There are many menu cards within the Cunard Archive, and more are deposited regularly by members of the public. This is the second in a series of posts by 2nd year History student Eddie Meehan. Eddie is working on The Grace Library of the Department of Applied Mathematics, a collection of 17th to 19th century mathematics texts, centred around the collections of Walter and Alicia Stott and Duncan C Fraser, and named after Samuel Forster Grace. The collection is rooted firmly in the city and University of Liverpool, and particularly in the Liverpool Mathematics Society and the Worshipful Company of Actuaries. 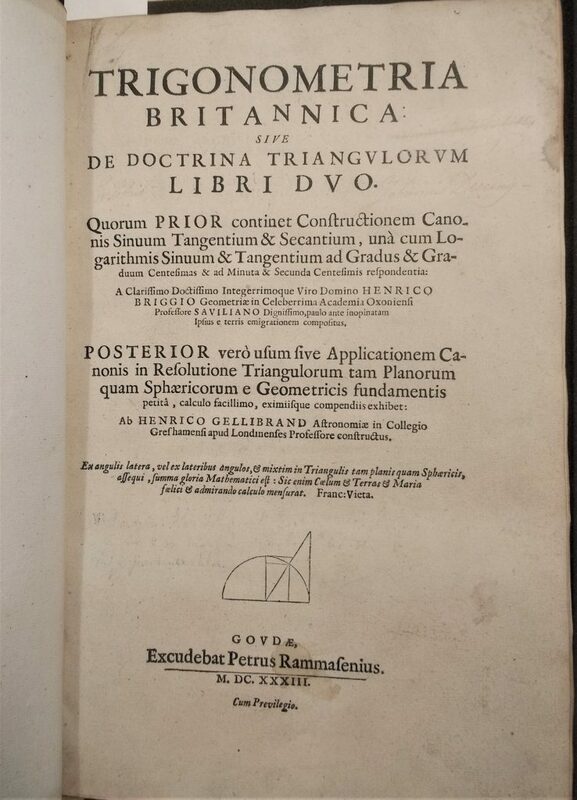 Another interesting item I came across in the Grace Library collection was the Trigonometrica Britannica, written by Henry Briggs (1561-1631) and published posthumously in 1633. The volume is notably rare, and is a table of trigonometric values that is noted for its high accuracy. Briggs prepared the tables while he was a professor of geometry at Oxford University, assisted by Gellibrand (1597-1637) who was a professor at Gresham College, London, and it was published in Gouda – at the time part of the Dutch Republic rebelling against Spanish rule. 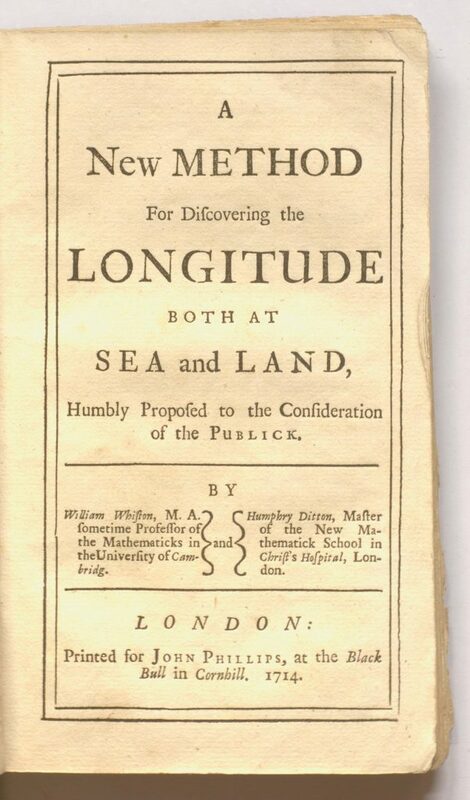 Tables of logarithms were vital to mathematics prior to calculators, particularly for work on navigation, which Briggs was particularly interested in and spent much of his time working on. In navigation, multiplication of many digit numbers was necessary, which could be performed by the addition of their logarithms. Thus, Briggs worked to compile the first ever table of base 10 logarithms. This simplified laborious calculations for astronomers and navigators at the time, while also proving very significant for more modern mathematics (although Briggs did not have any understanding of powers as we know them today). The work’s importance to navigation was particularly significant as Briggs also worked with the Virginia Company, who were a joint stock company created by King James I to create colonies in America. The improvement to navigation allowed greater European expansion into the Americas and also further European navigation of the ‘South Sea’, now known as the South Pacific. The work was also significant for astronomy, as prior to its publication many astronomers had feared that the difficulty of accurate calculations of logarithms would make many astronomical discoveries far more difficult. The copy in the university library is an original Gouda publication, inscribed by what appears to be a ‘Johannus Derning’ and with notes throughout. The book was given to the university in memory of Samuel Forster Grace according to its university bookplate. He was one of the most brilliant mathematicians at Liverpool in the early 20th century and was known for his work on tidal theory, but sadly died in 1937 at just 43 as a result of wounds suffered in World War I.
Woodcut printing is a technique that pre-dates the printed book; used for printing playing cards and religious prints, for example, as well as for block books. To create a woodcut image, the artist either drew directly onto a wooden block, or onto paper which was then pasted to the block. This image would then be carved in relief – so that the area to be inked stood out, whilst the white spaces in the finished image were carved into the block. Whilst the very earliest of books were largely printed without any illustration or decoration – perhaps leaving spaces on the printed page to allow for these to be added by hand – printers quickly realised that woodcut printing offered a simple means to add decorative features and illustrations to texts. Crucially, the fact that woodcut printing was, like movable type, a relief technique, meant that images and text could be set and printed together, on the same sheet of paper. By contrast, intaglio printing techniques – which involve an image being incised into a surface – required a different kind of press (a rolling press) in order to produce an image. As a result, if illustrations produced using intaglio techniques were to accompany text on the same page, the sheet would have to be printed twice – once for text and once for image. This was a timely and a costly process. Woodcuts, then, were the preferred method of producing images for early printed books. 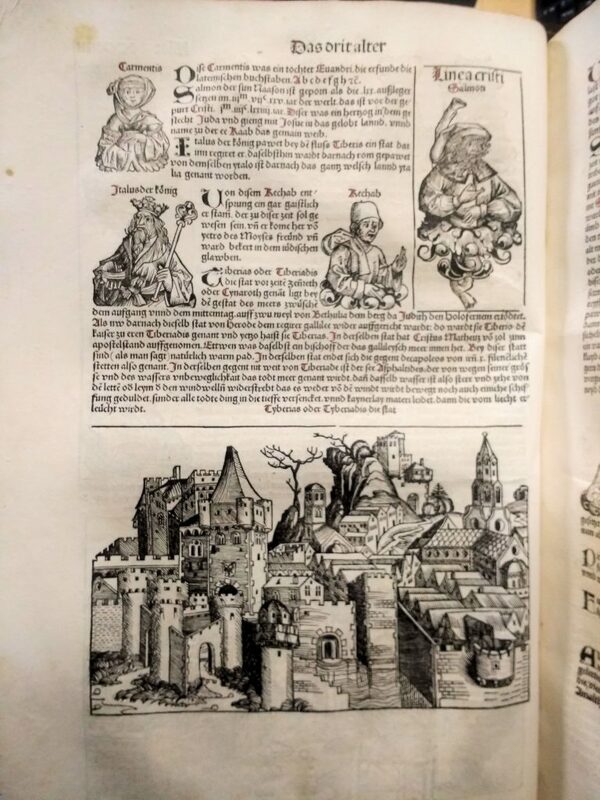 Earlier in the series we introduced the most highly-illustrated book of the 15th century – the Nuremberg Chronicles – with its 1809 woodcut images, produced using 645 woodblocks. Since woodblocks were durable, it was not uncommon to reuse images – sometimes even in a different work entirely. The Nuremberg Chronicle is an excellent example of the close marriage of text and image that woodcut printing enabled. Whilst the earliest woodcut images in books were generally fairly simple, outline images, designed to allow for colouring by hand, by the end of the 15th century the art of woodcut illustration in books had advanced such that the most sophisticated productions displayed considerable artistry, including the use of chiaroscuro effects to produce tones. Still, in terms of the quality of the finished image, woodcut was not able to compete with intaglio methods of printing. It was for this reason that copperplate printing eventually overtook woodcut as the preferred method of illustrating books, by around the middle of the 16th century. Because of the difficulties in printing text alongside copperplate images, it became common for illustrations to take up entire pages, which were then inserted in place before binding. As a result, books generally contained fewer illustrations and decorations than they had during the golden age of the woodcut. The use of woodcut printing was just one of the techniques revived by William Morris at the Kelmscott Press. The 87 wood-cut illustrations in this, the Kelscott Chaucer, are by William Harcourt Hooper, after drawings by Edward Burne-Jones. Suarez, Michael F. and H.R. Woudhuysen eds., The Oxford Companion to the Book, 2010. Vellum is a type of high quality parchment made from calf skin – parchment being prepared animal skin (usually calf, sheep, or goat) used for writing, printing and binding manuscripts and books. The British Library’s Making Manuscripts site has a short video illustrating vellum. 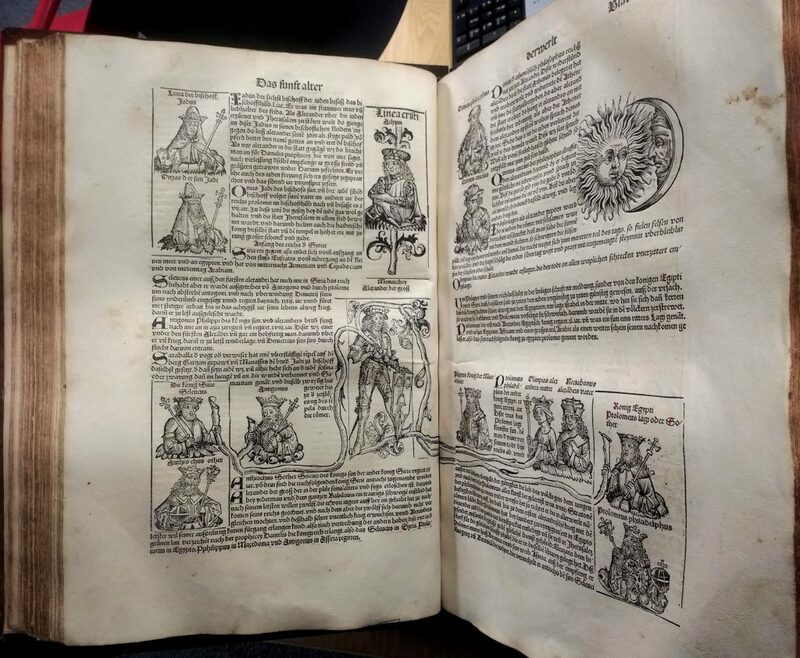 Vellum and parchment are most familiar as the material used for medieval manuscripts, but books have been printed on parchment from the start of printing in the mid-15th century onwards. 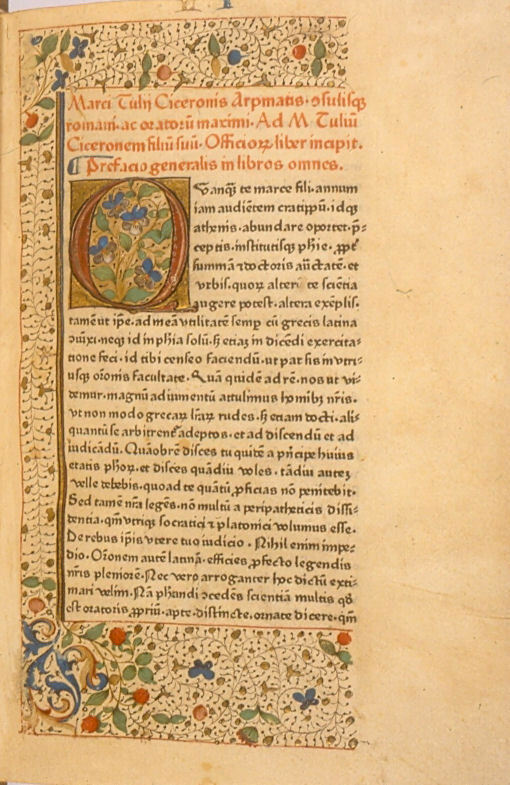 SPEC Inc.CSJ.F10, the first printed edition of a classical author (Cicero) was printed on vellum in 1465. SCA also holds several early 16th-century Books of Hours printed on vellum and decorated in just the same way as their manuscript companions. Fragments of parchment repurposed from manuscripts also appear in the collection as bindings, spine labels, endleaves, and page dividers. Books printed on vellum would be the exception, sometimes specially commissioned, and more highly valued than the larger run of paper copies. 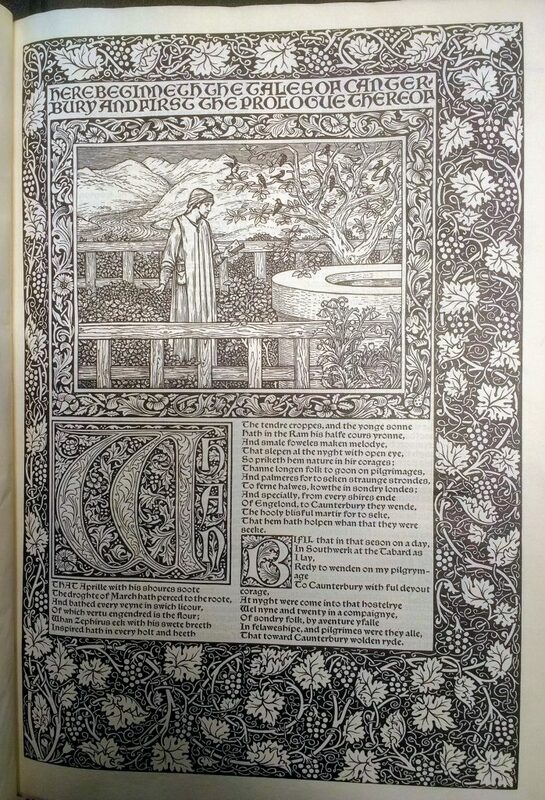 A few copies printed on vellum are a common feature of limited editions and particularly of the output of private presses, including the Kelmscott Press. A prime example of a prized book printed on vellum is the 1888 Roxburghe Club edition (SPEC H91.36) which was, appropriately, the first printing of a 15th-century manuscript. 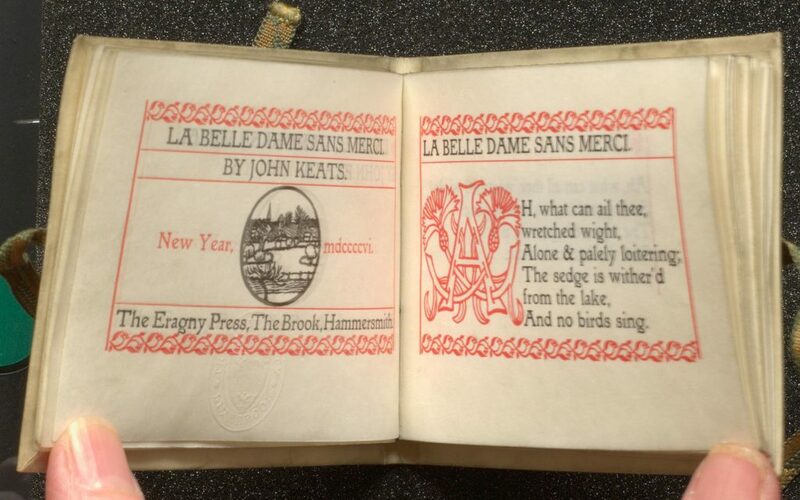 The fine collection of private press books bequeathed by William Noble includes (SPEC Noble A.22.18) one of the 10 copies printed on vellum (out of an edition of 210 copies in all) of the Eragny Press edition of Keats La belle dame sans merci (1896). SPEC Noble A.22.18. One of 10 copies printed on vellum. Noble’s bequest also contains many copies printed on ‘Japon (Japanese) vellum’ – not in fact parchment of any kind, but a particularly durable paper prepared to resemble vellum. ‘Limp vellum’ or limp parchment is a term used to describe bindings common in the 16th and 17th centuries, which might be simple undecorated wrappers or ornately decorated, for example the 1595 works of Tacitus at SPEC Y59.T4.2. Later books are also commonly half- or quarter-bound in parchment. SPEC Y59.T4.2. vellum binding, with tape added to secure by wrapping around the volume. 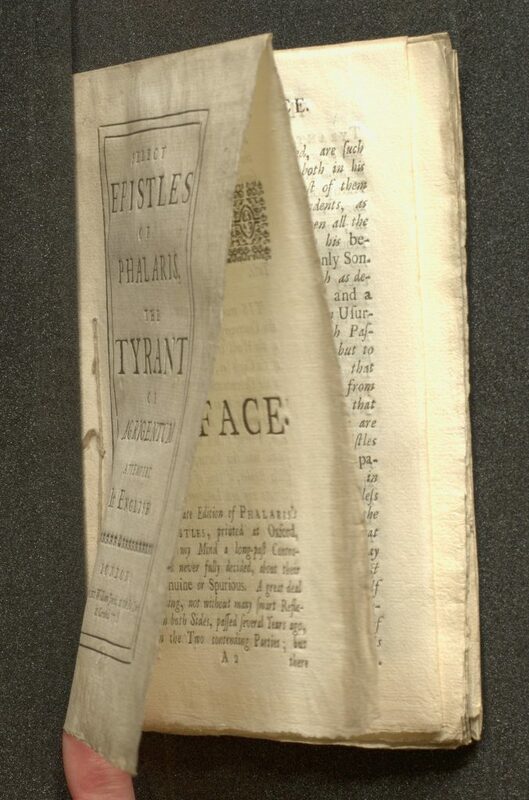 Unopened books or pamphlets are unreadable until the top and front edges of the folded and bound or unbound gatherings have been sliced through to separate the individual leaves (see our earlier post on format). 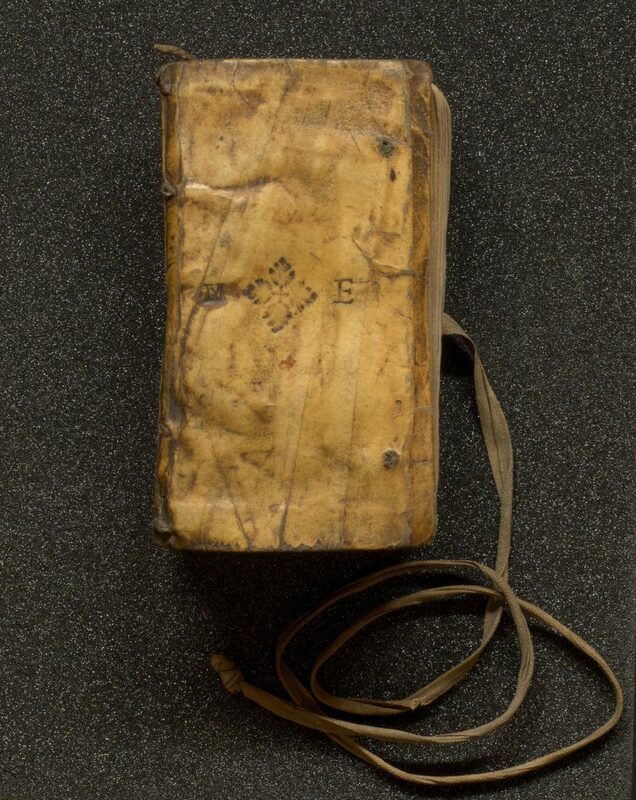 SCA has an example of a book which has remained unopened for over 300 years: SPEC J10.1(14). 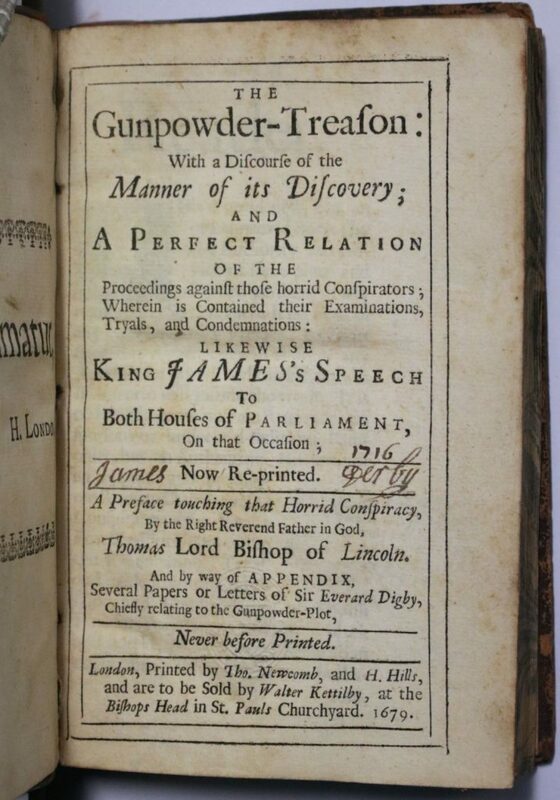 But fortunately the digitized copy from Eighteenth Century Collections Online gives access to the text. SPEC J10.1. (14). 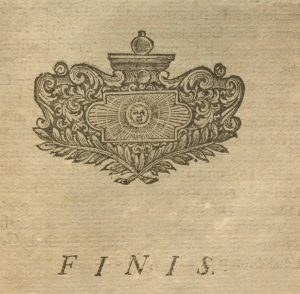 Select epistles of Phalaris, the Tyrant of Agrigentum (1718). Uncut may be used by the unwary cataloguer when the term unopened would be more accurate: uncut has the specific bibliographical meaning that the book has survived with the rough edges (deckle edges) of its pages untrimmed by bookbinders. This makes it easier to see many kinds of bibliographical evidence about the book’s production. Uncut or untrimmed pages are unusual, since books were issued unbound, or in a temporary binding for the purchaser to have bound up to the mid 19th-century development of the publisher’s binding. A modern example of a book showing the edges of the handmade sheet of paper is SPEC Zaina E.73 no.5 – the difference from the trimmed copy at SPEC Zaina E.73 no.195 is clear when they are side-by-side. SPEC Zaina E.73 showing deckle and trimmed edges. Uncut copies of a book also have the virtue of retaining all of the text and any later annotations, which are often lost when the page edges are trimmed or cropped in the process of binding and rebinding, successively reducing the margins. Untrimmed copies may be described as ‘tall copies’, to differentiate them from copies printed on larger sheets of paper (large paper copies’). The difference in size can be seen by placing the trimmed copy of SPEC Zaina E.73 on top of the untrimmed copy. SPEC Zaina E.73 trimmed copy no.195 on top of untrimmed copy no. 5. This post was written by 2nd year History student Eddie Meehan. 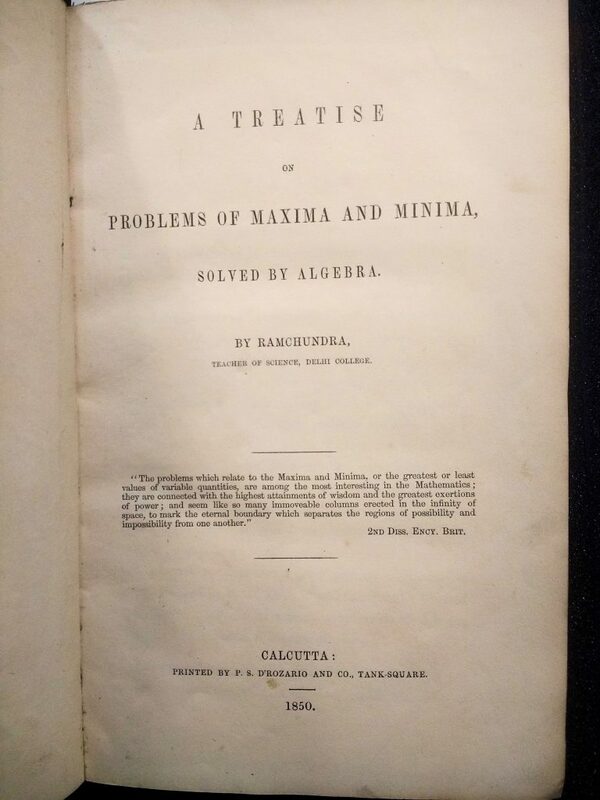 The Grace Library of the Department of Applied Mathematics is a collection of 17th to 19th century mathematics texts, centred around the collections of Walter and Alicia Stott and Duncan C Fraser, and named after Samuel Forster Grace. The collection is rooted firmly in the city and University of Liverpool, and particularly in the Liverpool Mathematics Society and the Worshipful Company of Actuaries. I’m working on the collection as part of History in Practice, a work experience module available for second year history students at the university. 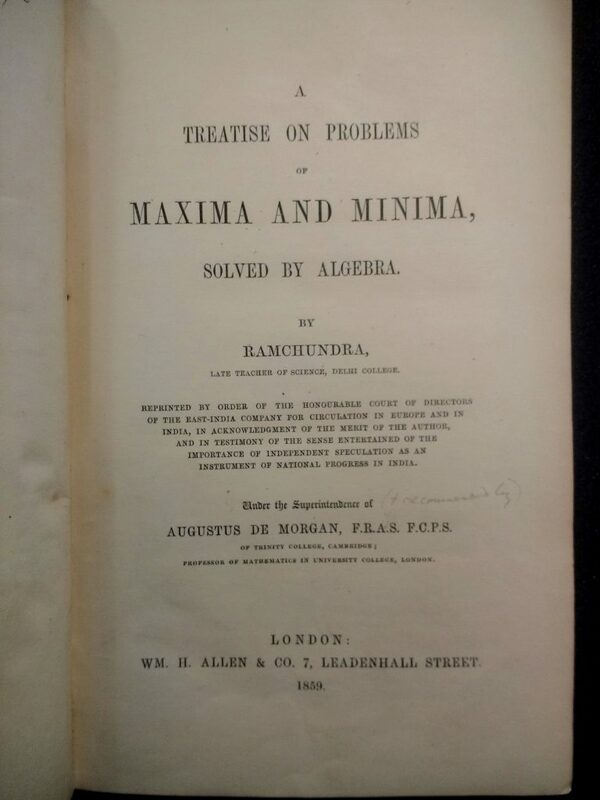 One item I catalogued in the Grace Library collection was A treatise on problems of maxima and minima, solved by algebra, written by the Indian mathematician Ramchundra in 1850. Ramchundra was born in 1821 in Panipat into a family of the Kayastha caste – a Hindu caste of bureaucrats – to a father who worked in the Indian revenue service. His father died in 1831, which forced Ramchundra into marriage in 1832 at just eleven years old, almost certainly for the financial support the dowry would provide. Ramchundra was able to pursue some education at the English Government School in Delhi and later at Delhi College, where he was later appointed to a teaching role. Here, he pursued his own work; the most significant of which was the Treatise that is in the Grace collection in Liverpool. Noted mathematician Augustus de Morgan published the work in 1859 in London to try and bring it to a wider audience outside of India, despite poor reviews from other British mathematicians working in India. During this period, there was an increasing belief in Britain that the colonial subjects of the British Empire should be ‘educated’ in European ways. This atmosphere may have stimulated de Morgan’s interest in the work, but it also hindered its acceptance. 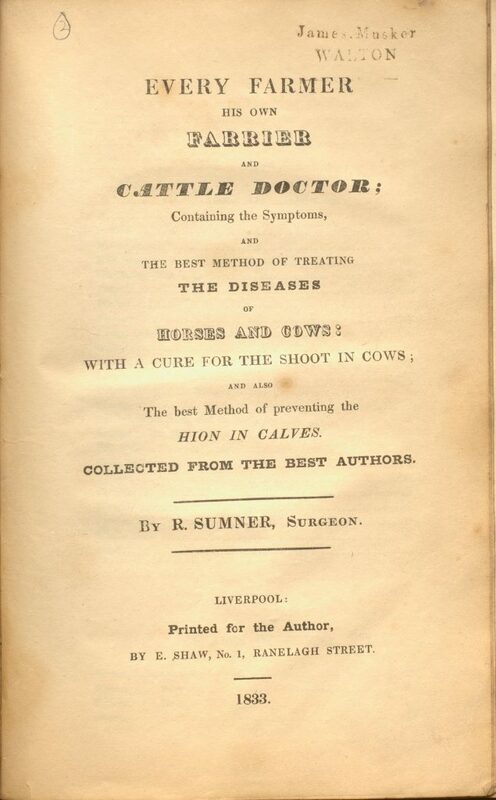 Despite being published in London, the book received little interest from scholars in Britain and Europe. Ramchundra is not particularly well known even to this day in mathematics – books have been written on topics covered by him that do not even mention his work. 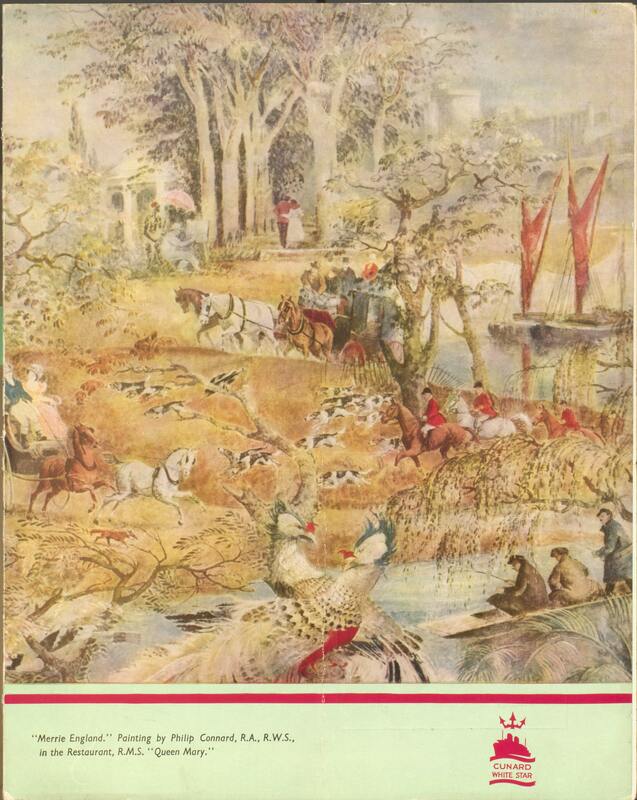 The Grace collection contains two copies of the work – one published in Calcutta and thus the original, and a copy of the London published version with de Morgan’s foreword. 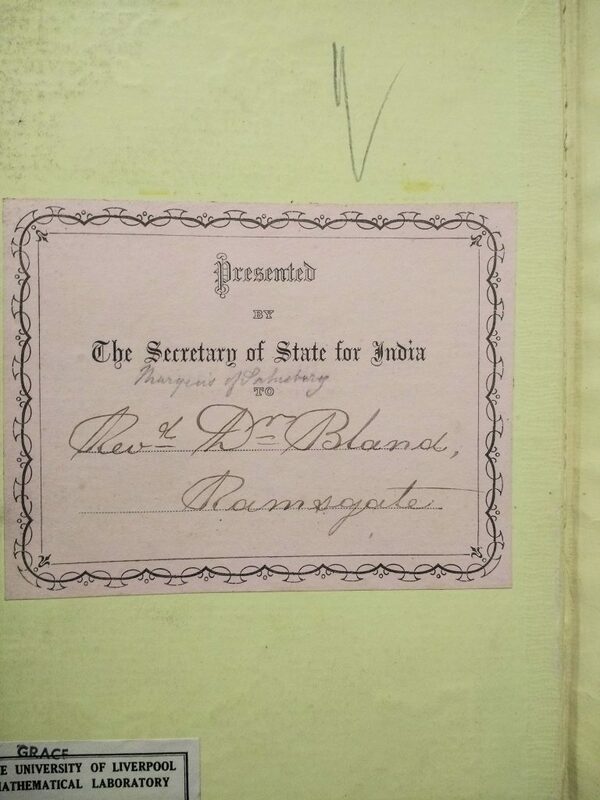 The London version was presented by the Secretary of State for India to a Reverend Dr. Bland, suggesting that it was at least recognised by the governing authorities in India. 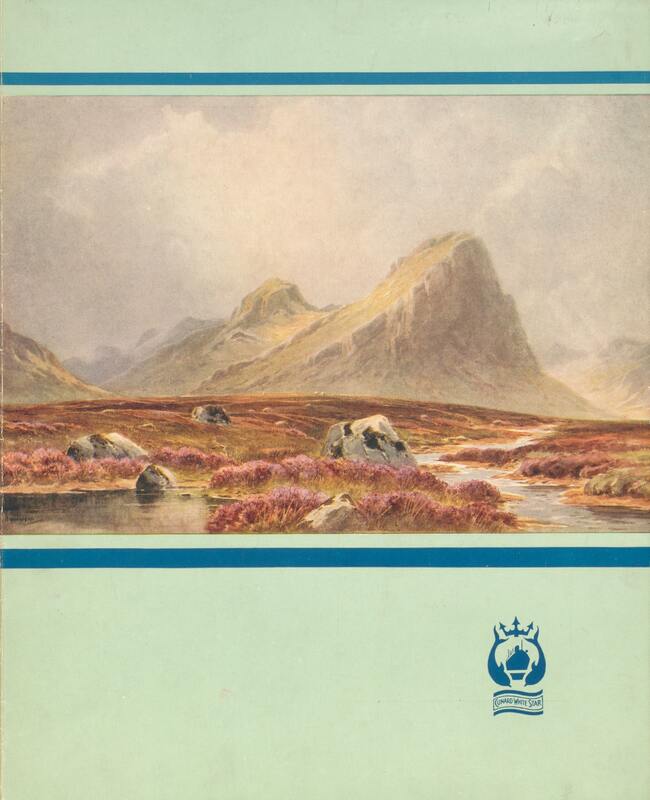 It isn’t clear how the original came into the possession of Walter Stott and Alicia Boole and then Duncan Fraser, who bequeathed the book to the University as part of the Walter Stott collection. Like so many elements of book design (bindings, bookplates, typography), the appearance of the title-page has been subject to fashions, and the amount of information offered on a title-page has varied over time accordingly. For example, whilst the earliest title-pages were relatively simple, in the 17th century it became standard practice to cram as much information as possible onto the title-page – with extensive sub-titles and detailed author and publisher information, often in multiple types, and within decorative frames. This trend died off in the 18th century, as a tendency for more simply set-out title-pages (often accompanied by half titles) took its place. This pattern repeated; the 19th century saw a return to more elaborate title-pages, whereas the emergence of modernism accompanied a more stripped-back approach in the 20th century. As engraving came to be used more widely in book illustration from the late 16th century, engraved title-pages emerged. 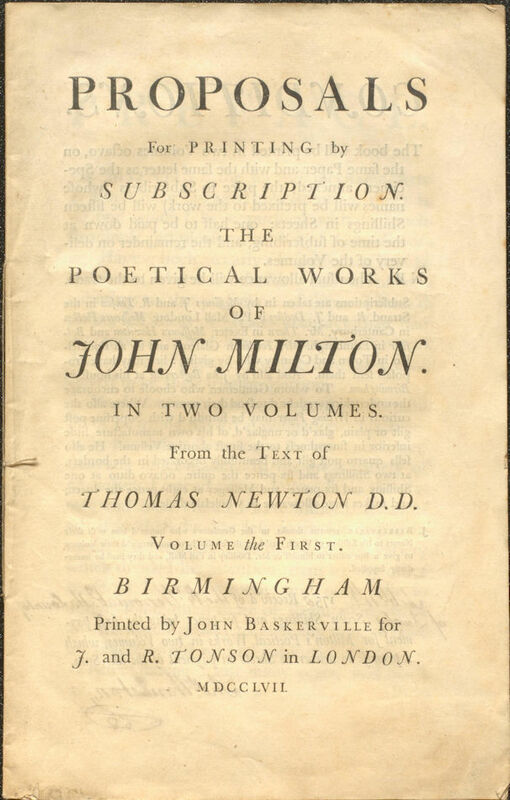 Occasionally books contained additional engraved title-pages alongside a letterpress title-page, as in the example below. The earliest of printed books do not contain title-pages at all however; nor do most medieval manuscripts. Instead, these texts are generally identified by the “incipit” and “explicit” – the opening and closing words of the text, from the Latin verb incipere (‘to begin’) and explicitus, meaning ‘unrolled’. 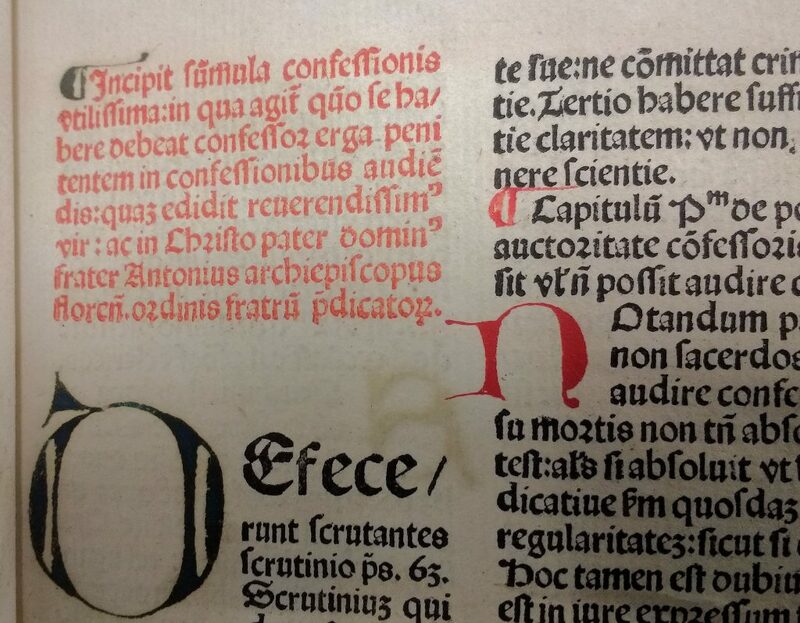 An example of an incipit from a work printed in 1481. 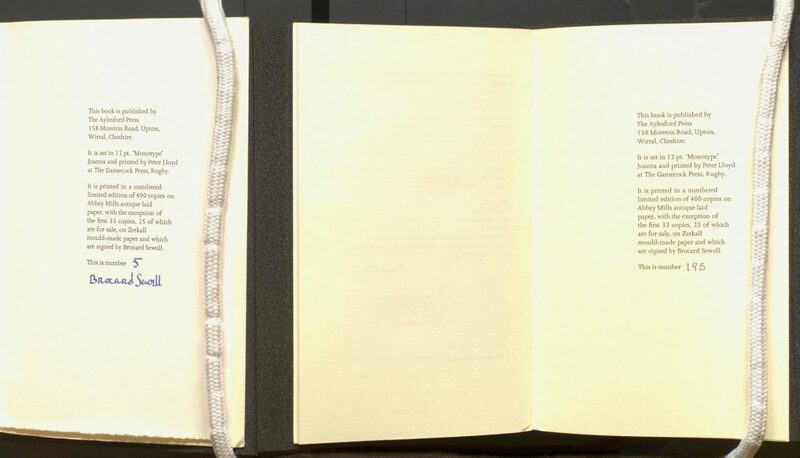 Early printed books often closed with a “colophon” – a closing statement, providing, for example, the name of those involved in the book’s production (scribe, printer, publisher), and place and date of publication. Smith, Margaret M. “Title-page” in Michael F. Suarez, S.J. and H.R. Woudhuysen eds., The Oxford Companion to the Book, 2010. Smith, Margaret M. The title-page: its early development 1460-1510, 2000. 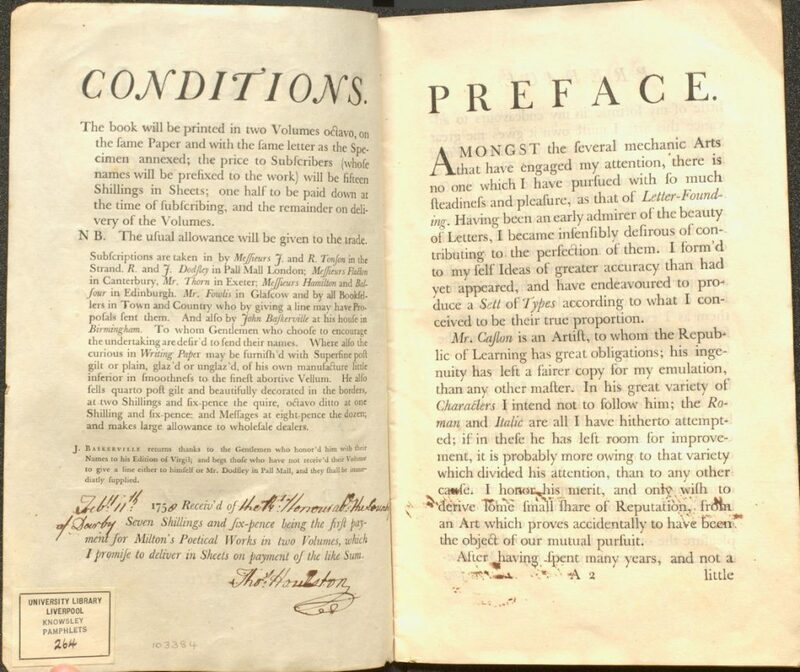 From the 17th to the early 19th century, and occasionally since then, books might be issued ‘on subscription,’ to solicit orders in advance of publication from subscribers attracted by a preliminary proposal. A printed list of subscribers’ names would often appear in the published work. 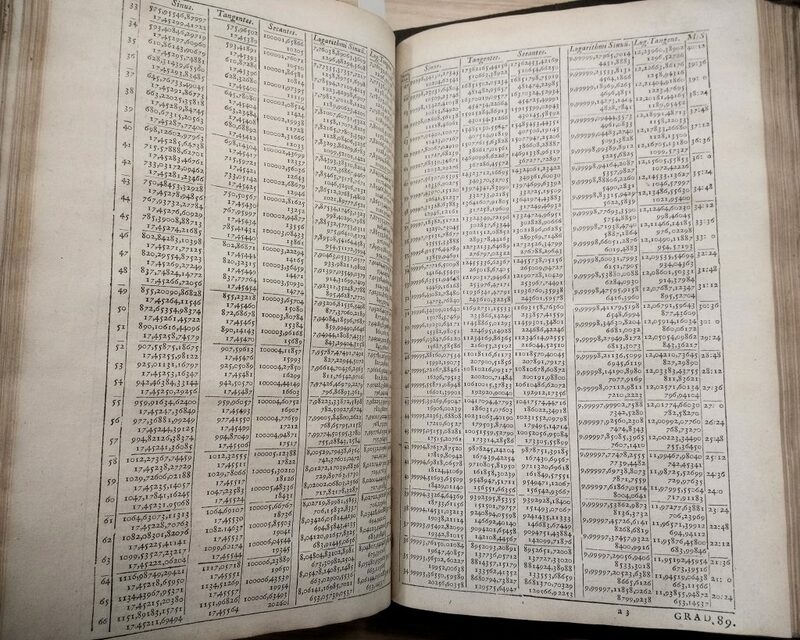 The first known subscription list is that for the second edition (1625) of John Minsheu’s Guide into Tongues (SPEC Knowsley 349/oversize but without the list of subscribers). 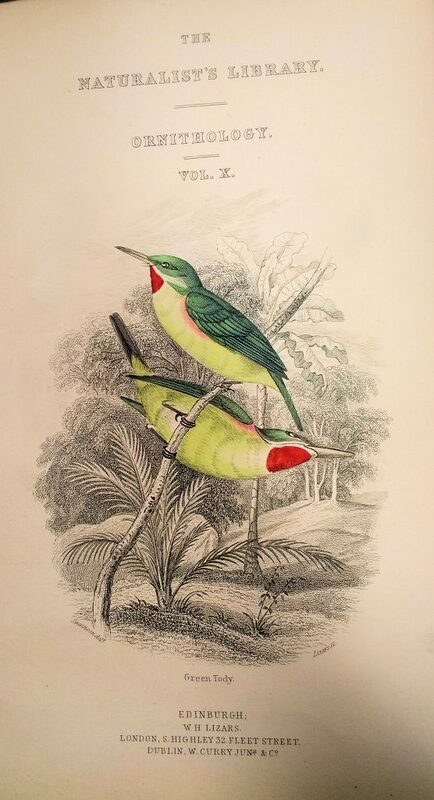 Books whose publication was financed by subscription typically included particularly expensive books (for example highly illustrated books), specialist works (for example scientific and musical works), privately printed books, or special copies (for example, ‘large paper’ copies printed on a larger size of paper) making up part of an edition. 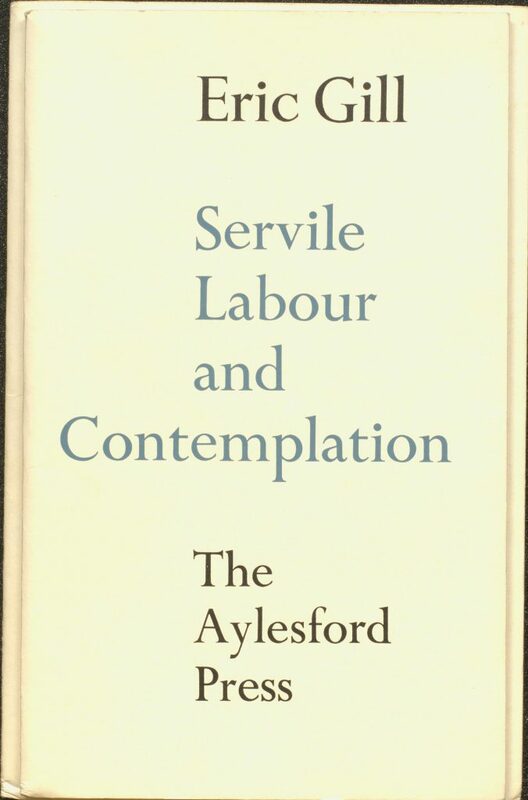 The response to the subscription helped gauge the market for the work prior to publication and acted as a guarantee for the bookseller’s outlay on publication costs. Receipt for the Countess of Derby’s first payment for Milton’s Poetical Works. Signed by Thomas Houlston. The lists of subscribers in the published work were often arranged hierarchically, giving the most eminent names first, and might include addresses and occupations. 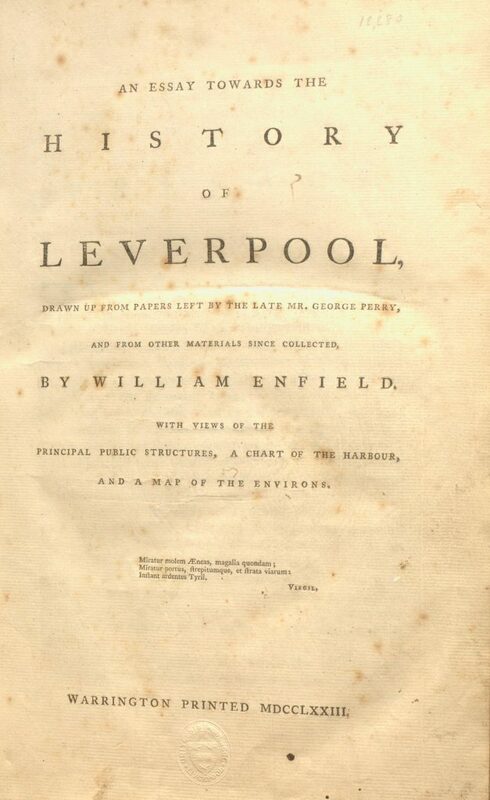 William Enfield’s 1773 Essay towards the history of Leverpool included views and a plan separately so subscribers could choose which parts of the work they wanted. 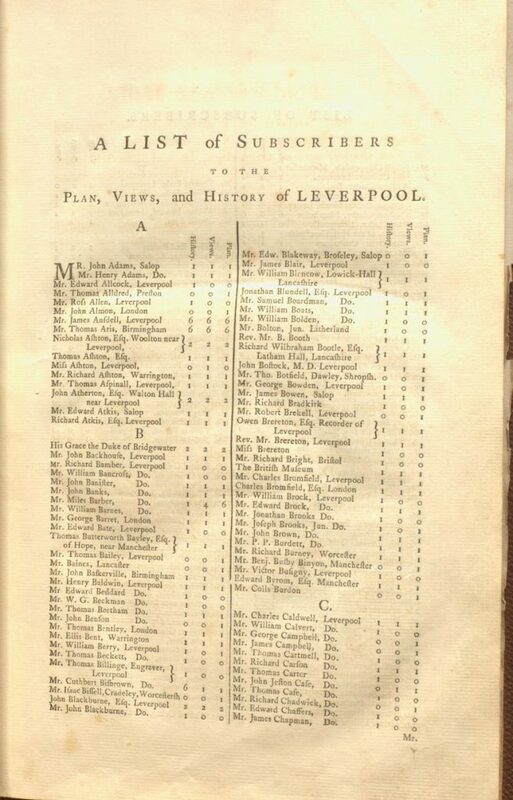 List of subscribers for Enfield’s work showing some hierarchical arrangement and many Liverpool names.